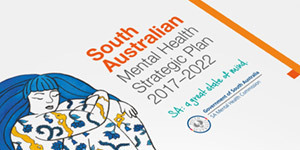 The South Australian Mental Health Commission has released its Key Finding Discussion Paper outlining the Top 7 themes on mental health and wellbeing raised by South Australians. Since October 2016, more than 2200 South Australians from across the State have generously shared their views, stories and concerns by participating in 176 conversations and consultations, sending in submissions and completing over 950 surveys. The Key Findings Discussion Paper highlights the most consistent themes raised by South Australians during the wide-ranging and inclusive conversations and consultations conducted by the Commission. The release of the Paper is an important stage for the Commission which is leading the development of SA’s new Mental Health Strategic Plan. The Plan will help set the direction for strengthening the mental wellbeing of South Australians and will be finalised later this year. SA Mental Health Commissioner, Chris Burns said South Australians were asked to tell the Commission what’s happening in SA in relation to our mental health and wellbeing – in our systems and organisations, professional and working lives, personal lives and relationships. “South Australians shared their views on what’s helpful, what’s unhelpful and what our services should look like,” Commissioner Burns said. Commissioner Burns wants further feedback on the themes outlined in the Discussion Paper. “I invite South Australians to read the Paper or the summary on our website because I want to make sure we’ve heard their ideas accurately and understood their views,” he said. There are many ways to have a say – people can complete our online survey, attend one of our Pop-up stalls in libraries or shopping centres or participate in a Listening Post. The Discussion Paper, shorter summary Paper, pop-up stall locations, dates and times of Listening Posts and a survey link can be found at samentalhealthcommission.com.au.